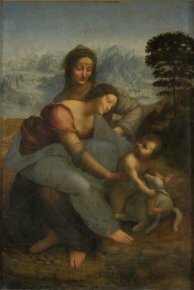 7/1/12 - Restoration - Paris, Musée du Louvre - The restoration of Leonardo da Vinci’s Saint Anne has once again sparked off a debate, when in fact nothing new has happened since the month of October (see our article in French). We had known since the beginning about Jean-Pierre Cuzin’s opposition to this restoration, and we also knew that he had resigned from the Comité scientifique about a month and a half ago. While he has nothing to say about it, some of the members have confirmed the fact that he was against lightening the varnish in principle. Jean-Pierre Cuzin always said that he appreciated the painting in its condition before the restoration and wished for it to be conserved with the colors as they were. He had never spoken out openly for the operation and wanted to limit it strictly to treating lifted areas and stains. According to the Louvre and the C2RMF, his resignation, which he himself kept very low key, was in a certain way logical. Although we found out about Ségolène Bergeon Langle’s resignation in Daphné Bétard’s article published on the website Artclair, we were also aware of her opposition to the project. She confirmed to us what she had already told The Guardian, that is that she was keeping her explanations for the director of the Louvre, Henri Loyrette. However, she told us that she never claimed that the cleaning on the painting had been overdone as stated in the headline of the English newspaper article, a sensationalist statement which was extensively repeated in the international media. Once again according to our sources, during the second and then even more so during the third meeting of the Comité scientifique, all of the members, including Ségolène Bergeon Langle, admitted that the restoration problems posed by Saint Anne were not technical but aesthetic. In any case, three points had to be solved : the issue of the trunks on the right of the work partly painted in the 19th century by a restorer, that of the unfinished area on the rocky ground, treated like a brownish gray, with a sort of very harsh line on the horizon. And finally, the whitening on the child’s body which we noticed when it was presented to the press. If keeping the trees was finally Vincent Pomarède’s decision as he implied at the time, and if it was logically decided not to touch Leonardo’s unfinished area, it seems that Ségolène Bergeon Langle’s resignation had to come from the question concerning the whitening of the child Jesus’ body. Yet on this very subject, the unanimous opinion, expressed both by the members of the committee (except of course Ségolène Bergeon Langle) and the C2RMF laboratory, was that this was a characteristic sign of mouldiness (that is, minute cracks) on a recent varnish, and that it could be attenuated by thinning it (while still keeping a thickness of about 6.5 microns on this spot). According to one of our sources (we have not seen the painting since it underwent this operation), this allowed it "to recover in this area the shading, light and the original form painted by Leonardo". Vincent Pomarède, who chose not to comment on the choice of Jean-Pierre Cuzin and Ségolène Bergeon Langle to withdraw from the scientific committee, did however confirm to us that these resignations did not really come as a surprise, given their positions during the last meetings. He emphasized, repeating what he had said when the painting was presented to the press, that he wanted these commissions to be in opposition so as not arrive at a weak consensus. Once a decision has been made, in this case by him, it is understandable that some members may prefer to leave rather than stay and accept a choice they do not espouse. The director of the Département des peintures at the Louvre also told us that the lightening of the varnish was now finished and that a meeting of the Commission de suivi de restauration  would take place on Tuesday 3 January to bring up the question of the repainted areas. This is what we can tell you so far about this affair. We hope that once Ségolène Bergeon Langle has finally met with Henri Loyrette, she will be able to give us her version of the events. The committee following the restoration.